Q. For the second slam this year, the top four players in the world will play in the semifinals and into the finals. What does it say about that group of four, and how tough it is to break into that between the four of you guys? RAFAEL NADAL: Seems like top four players are doing well. That's the thing. Top four are very solid today. The previous years, too, my opinion. For last few years top four players are very solid in almost every tournament. That's difficult to see that in the past because that's very difficult. Tennis is a very competitive sport. It's very difficult. In almost every tournament, the top four players be in the semifinals. So is I think is very good news for tennis. Q. You're obviously very high up, but if you're in the 10s or the 20s and you're looking, you're thinking, I don't only have to topple Nadal, Djokovic, Federer, Murray, I mean, that is a gauntlet to have to get through to win a tournament. How daunting do you think that is for the players that are lower ranked looking at that solid a group up there? RAFAEL NADAL: You can ask them, but the rest of the players win tournaments, too. We are not winning every week. But it's true in Grand Slams because is probably best of five. That's a little bit more time for us. We have a little bit this extra advantage, and we're doing well. I think the rest of the players feel that they can win, too, but that didn't happen this year. We'll soon see. Q. You were aggressive today. Were you trying to think of keeping the match short? RAFAEL NADAL: No. I try my best. I don't think about having a short match in quarterfinals of a Grand Slam. I think about try to win the match. I think I started the match really well with some very good points, few very good passing shots. Yeah, probably he was -- I ask him how was him, but he told me, I am fine. But I think he was tired because the match of yesterday. You know how tough is play best of five two days in a row, and he played against very difficult opponent like David yesterday. So is always a very hard match against him, and probably he was tired. You know, that happens when the rain comes. I think I did well. I did a very good match, I think. Q. Do you think you have been getting better and better as the tournament has progressed? RAFAEL NADAL: I think I am playing well since the second round. Against Mahut I think I played a good match. Against Nalbandian, too. And for sure against Muller. Today I think I had another one. I am playing better. I'm very happy about this US Open. Doesn't matter -- well, doesn't matter. I will try my best to be in the final. But even if I lose tomorrow, I am happy about my US Open. Wasn't an easy situation for me coming to this tournament after having a not easy summer for me. I am doing a lot of things much better than few weeks ago. For me win is important, but feel myself very competitive and have the feeling that I can win is probably even more important. Because if you had that feeling that you can win, you don't win this week, maybe not next one, but at the end you will win. But with the feeling of Montreal and Cincinnati is different. Q. How happy are you that the final has been pushed to Monday? RAFAEL NADAL: Is important change, but I think is fair. Is a normal change. That's something really normal. If not, they have big risk to don't have the right final. Having one part of the draw playing four matches in a row, and normally there is tough matches there. They can put the final on Sunday, but is a big risk. Q. Were you involved in discussions with the organizers about the schedule at all, about the change to Monday? RAFAEL NADAL: About? No, no, no. I know that because they announced it two days ago or yesterday. Yesterday afternoon? No, I know that when I was at the hotel. I have nothing to say. I wasn't involved in nothing of that. Q. They said that it was a collaboration between the players and the TV and the organizers. So do you know which players were involved, if any players were involved? RAFAEL NADAL: Not mine. I wasn't there. After what happened at few days ago is normal they want to say a collaboration with the players, but I think was a meeting with the ATP what changed the situation. They feel that if they put the final on Sunday we are gonna keep talking. So that's probably why. And for one or for other reason, I think they did a good job. Q. When you know Andy is hurting but he won't retire, he won't quit, do you appreciate that? How does that affect your approach? RAFAEL NADAL: I will try my best. I don't know. He has a fantastic performance physically and he's strong mentally, so will be very difficult match for me tomorrow. Q. How hungry are you to defend your title and win this last slam of the season with the passion that you describe? RAFAEL NADAL: I am in semifinals and I'm happy with that. I will try my best to win that. I don't think about the title. I think about the match of tomorrow. Try to recover fast today, try to be in perfect condition for tomorrow at 2:45 to have a fantastic match of tennis and play my best tennis. Q. How are you going to prepare for this tonight? What do you see yourself doing or not doing? RAFAEL NADAL: Having dinner. (Smiling). Watching a film maybe. Nothing. Nothing special, no? I don't believe. What do you suggest? (Laughter.) I don't know. For me, just to sleep well, I don't know, have good rest. That's all. Nothing special. Q. The players were very angry. Do you feel coming out of this slam you're confident that perhaps players can get together and make some real changes, or do you fear it's just going to be a bit a controversy here and then go away and nothing will change? RAFAEL NADAL: I really hope not. I really hope the players will be together. We will fight to change that. We start to talk with each other, and is the right moment, I think. Q. Andy Murray said he thinks it's a closer matchup between you two on hard courts than on clay or grass. Is that how you see it, too? RAFAEL NADAL: If he's closer, he will beat me because clay was very close, and on hard especially -- on grass was very close match. He was beating me one set, and I remember important mistake with his forehand, was an easy forehand to do, to put 15-40 in the beginning of the second, so was close. Was really, really close match. 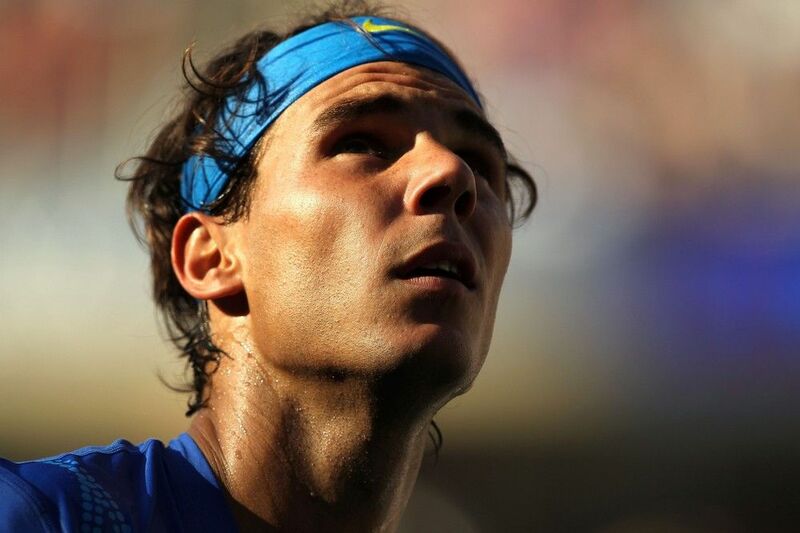 He's fantastic player on all the surfaces and it will be a very tough match for me and hopefully for him, too.